Traveling to New York City as a child is such a memorable experience; there are so many things to see and do. For the kids, or adults for that matter, sometimes nothing is as enjoyable as some yummy bites. New York is filled with culinary delights of all types, but let’s face it, our kids do not always have the same idea of good food as we do. Like most parents, we always try to have our kids eat healthy but periodically we fall off the wagon. A trip to NYC is a perfect excuse to let your kids sample some of their favorite sweets and treats in a fun atmosphere. 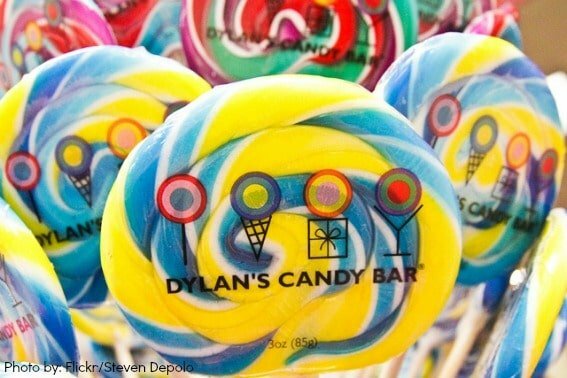 Spend some time sampling treats at theses famous candy shoppes. These spots will make you feel a little less guilty because they aren’t just candy stores, they are destinations! In addition to the famous three-level, nostalgic candy slinging, eye-popping Dylan’s Candy Bar in mid-town, you can also visit the nearby M&M World for a dazzling array of all things M&M. You might also run into Ms. Brown like we did on our last trip. In the Times Square area check out the Hershey’s store where you can purchase a 5 lb. Hershey bar similar to the one my kids gifted Grandpa with this past Christmas. After all, chocolate brings out the kid in all of us! Another Times Square favorite is Wonkaland in the Toys ‘R Us store. Anyone with a fondness for all things Wonka will enjoy imagining Mr. Slugwoth hawking his Everlasting Gobstoppers, which you can buy right here. For an interesting sweet tour, check out Economy Candy on the lower East side. They specialize in hard to find treats and bulk items, a little nostalgia, and a lot of candy. Papabubble is a hard candy chain store with a location in Little Italy. Think part candy store, part chemistry lab and you have Papabubble with crazy and interesting flavors and aromas to boot. If your family loves desserts, NYC has some amazing stops for you as well. 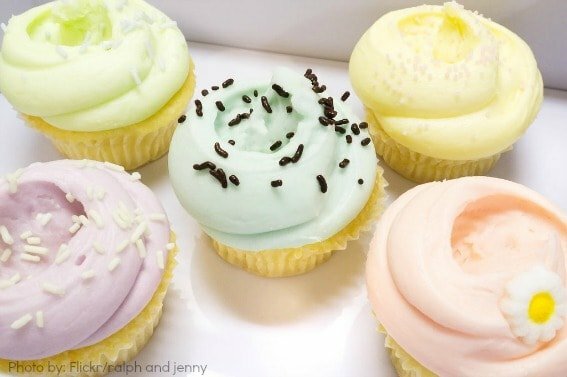 The Magnolia Bakery is one of the most popular bakeries in NYC. They have a location in mid-town where you can get your sugary cupcake fix and your little one can lick the frosting off a cupcake. 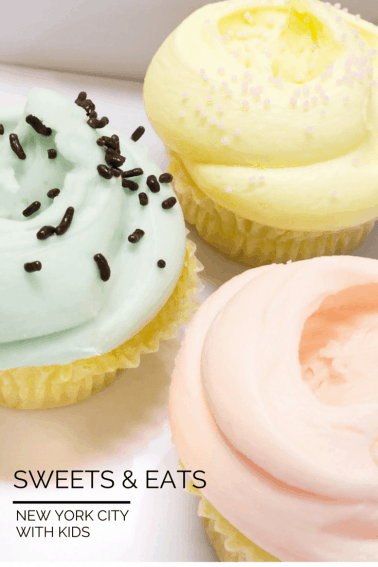 Try the most popular Vanilla Cupcake with pink vanilla icing. Another interesting stop with a fancy ambiance is Chikalicious where families can sit down at the dessert bar and share an éclair or some shave ice. Always check in advance for hours of operation. Lastly if you are in the mood for a dessert more conducive to continuing your walking tour of NYC try the cake pops at Butterlane. At two dollars a pop it’s a portable sweet treat!!! Although your kids may not be hungry for real food after all of these sweets, you can find some really interesting and kid-specific locations for a meal.Warning: Some of these are not your typical culinary idea of NY style restaurants. They have a bit of a kid bent. But isn’t that what you are looking for anyway?? Families love American Girl Café in midtown. After a spa-like day for your daughter’s American Girl doll, enjoy a meal with tons of other girls at this famous spot. Serendipity 3 in midtown might be a compromise choice for all. 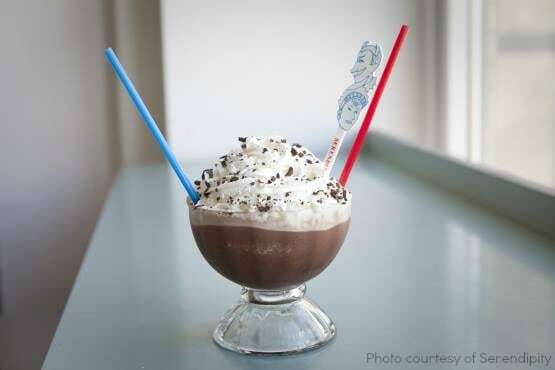 Be sure to try out the Frozen Hot Chocolate (pictured above), a house specialty, but also be prepared to wait for a table or takeout. If you are not brave enough to sample a hot dog from a street cart (although it is said these are some of the best you can get especially near Central Park) sit down at an authentic New York style deli. Katz’ Delicatessen will serve your tyke up a hot dog New York style in a bustling place full of memorabilia. For a more off-the-beaten-path experience try Ellen’s Stardust Diner where Broadway talent and wannabees sing for your supper. Everyone will enjoy the entertainment here, especially if you have a budding star in your crowd. For a more sinister dinner show check out Jekyll and Hyde’s. Not necessarily recommended for the smallest of explorers (we actually had to leave with a 5-year-old once), but thoroughly enjoyable for older kids and adults. Corny humor and spooky antics are part of the show. You are here for the experience, not the food. Ninja New York recreates Ninja culture in a highly stylized Japanese restaurant. Walk the Ninja path and be prepared for a scare! Kids love the atmosphere and the ninjas. When all else fails you can get a kid staple at the Peanut Butter and Company restaurant in Greenwich Village, where there are all different types of PB sandwiches. And of course loved by all, try BBQ at Virgil’s in Times Square, a place so tasty that everyone licks their fingers like the kids. After a belly full of sugar and tasty tidbits, stay overnight at the Omni at Berkshire Place. Your kids will enjoy turn down service including milk and cookies for just one more sugar blast. Bon Appétit!!! Disclosure: I received a complimentary night stay at the Omni Berkshire Place and a complimentary lunch at Virgils in preparation for writing this article. No specific opinion was required and all opinions expressed are my own. MMM….now I want some sweet treats and some of Virgil’s wings! I just gained 5 pounds. Looks yummy! I took a tour of New York City with my kids through Zip Aviation. Highly recommended, the kids loved it! We will go back for sure. You know what’s horrid? I’ve been there with my family twice now and we never even managed to hit ONE of the places you listed. Looks like we must make a return trip!! !